Designed and built for filling K-Cups with ground coffee and other products. The Image multiple auger filler can be set up using 2 to 16 augers. 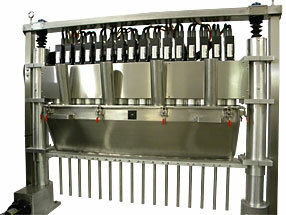 Fast and reliable servo motors power each individual auger for precise filling. Perfectly designed and fabricated stainless steel hoppers allow smooth flow of the ground coffee towards the augers. Each auger comes with its own agitation arm for the finer grinds. Allen Bradley color touch screens are standard.